Whispers in the Loggia: Saginaw's "Father Grandpa"
...for the diocese of Saginaw. Should anyone be curious: no, it wasn't a repeat of the local establishment's mistreatment of Danny that led Deacon Bill Spencer to the Michigan fold. A father of three and grandfather of four, he and his wife of 45 years were active in the Charismatic movement and moved there some years back. As his wife lay dying in 2004, though, the call came, and vocation magnet par excellence Bishop Robert Carlson -- who's presided over the explosion of Saginaw sems from two to 23 in his 34 months there -- gladly accepted. “Over the years, my wife and I were always active in the church in a variety of renewal movements and in the parish, so being close to the Lord and the church is not something new. I was also an extraordinary minister of Holy Communion and a lector. In more recent years, I was asked to be an adult server, which meant I was often on the altar for Sundays, Holy Days and special celebrations. 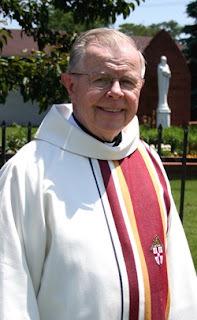 All of these activities made me happy and peaceful, although I never tied them to my being a priest, since I was happily married,” Spencer said about hearing the call to the priesthood later in life. “The thought first crossed my mind about being a priest when I was praying, shortly after my wife went on chemotherapy about four years before she died, but I put it out of my mind as an idle random thought. Then, during my wife’s last year or so, as I was walking near the church when I went to get her Holy Communion, the thought about being a priest came more intensely, but again I put it out of my mind. When the doctor told us that he was going to stop the chemotherapy and then told me that my wife had less than a year to live, I asked the Lord what I should do at that time. Again, the thought of the priesthood came to me. I prayed and waited to see what would happen. My wife died about four months later. “My pastor (later) suggested the possibility of the priesthood after my wife’s funeral luncheon. I was surprised because I had not said anything to anyone about my thought about the priesthood. After that I prayed more and asked the Lord for guidance and affirmation. Within two weeks after the funeral, three people suggested that I consider the priesthood. “Later, as the desire became stronger, I decided to take steps, like meeting with my pastor for discussion, going to Sacred Heart Major Seminary as a lay student, inquiring about the possibility of acceptance as a seminarian and receiving spiritual direction. It's already been revealed that Spencer will be assigned as administrator to a parish in the diocese of 140,000. He'll be the third priest ordained by Carlson since his February 2005 installation in Saginaw. Three more transitional deacons are scheduled for priestly ordination there in May.